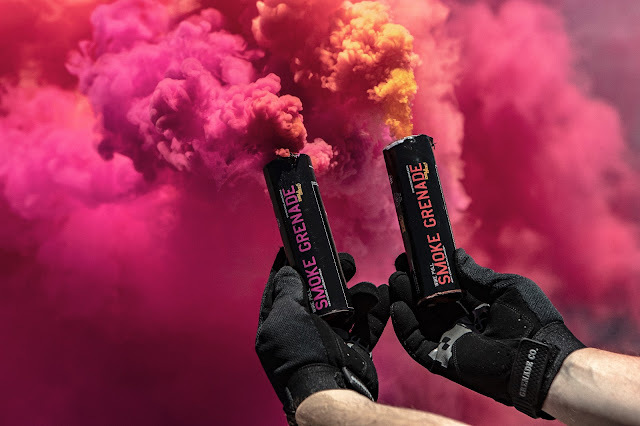 As the use of smoke grenades has become more and more popular in airsoft, we have seen Enola Gaye – the worldwide leading manufacturer of pyrotechnics - release more products to satisfy airsofters needs for concealment and usually it’s the bigger, the better with players wanting to smoke out their competition and get the upper hand! So whenever the company releases a new product you would regularly get more than you would before! However this time EG has reverse engineered their famous WP40 to give the consumer a whole bunch less, but, why? In game situations a thick smoke cover is what players strive for to give them a screen of cover, but there are situations where less is definitely more, and one thing I’ve found whilst working with the guys from EG is that when you need a smoke effect for a photographic shoot, you don’t always need the entire area smoked out. The new EG25 offers users a super compact unit – which is also absolutely adorable with being the size of a glue stick – that has a considerable output but for around 30 seconds. This gives photographers and players more than enough time to get the shot they’re after and means it clears relatively quickly meaning you can get on with the next shot even if it features another colour of smoke. 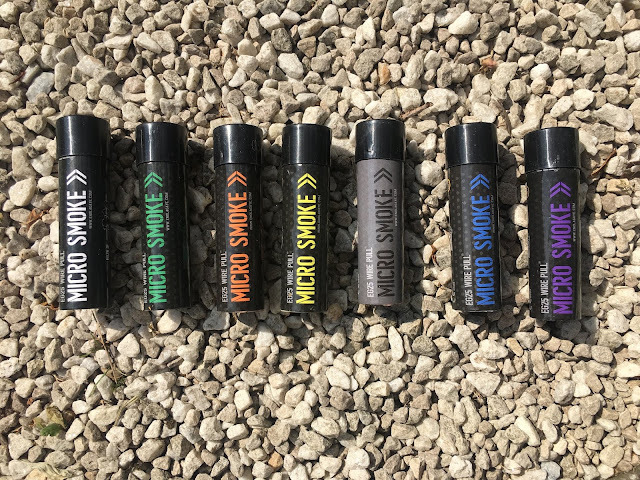 What I really, really like about the EG25 Micro Smokes is the size of them, we all know that anything in miniature size is cute – be it shower gel, deodorant, whatever the item is, it’s definitely cuter in miniature and these are no different! The size makes it easy to carry a load of them in a backpack or dump pouch without weighing you down too much. Whilst I was testing the range of smokes, they on average lasted around 26 seconds, had a good output and the smoke colour is true to the colour of their bigger counterparts. The time/output combined means the smoke clears quickly and easily from an area which means less time between shoots waiting for colours to clear. The EG25 Micro Smokes are available in the full colour range (8 colours) and they use the Wire Pull igniter. They’re available as a single smoke or in packs of 10 from Enola Gaye dealers (some will even let you mix and match colours) and prices do vary but whilst I’ve been at events with the team, the prices have been super affordable. Check with your local EG stockist for deets! Overall, I think EG has done a fab job with the EG25 Micro Smoke – from the size to the output and even price point they seem to have got it just right. I can see these becoming a staple in airsoft photographer’s kit in the near future. It’s also awesome to see the brand catering for a different aspect of the sport. Soon to be released to the UK market is something I have been waiting for, for almost 3 years! After adding black to their line of colours late 2016, Enola Gaye is yet again adding another colour to their already impressive line of smokes - PINK! YES! One sunny afternoon whilst attending the Midlands Airsoft Fair at the Gaol Events in Oakham I heard the shout ‘We don’t make pink smoke’ originate from a smiling face at the Enola Gaye booth – I turned my head and raised my sunglasses and shouted back ‘well you should’ and it has finally come to fruition! 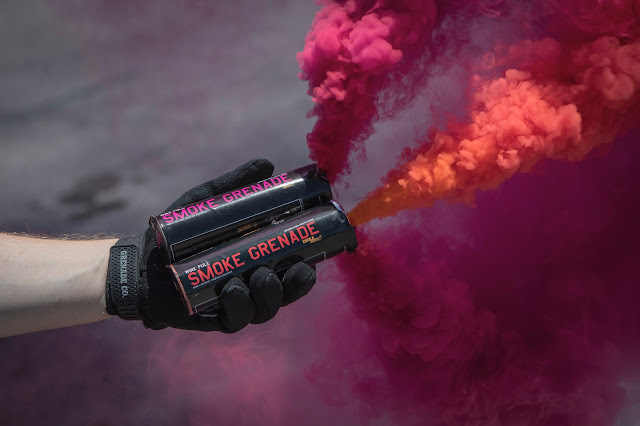 Eventually we will see the pink smoke released in all smoke products including the EG25, EG18, EG18X and SD75 but we will see the pink WP40s released first, so whether you are a player that needs a heavy smoke screen that lasts for minutes or a photographer that wants just the right amount of smoke for ‘that shot’ Enola Gaye will have you covered. So what’s the colour like? 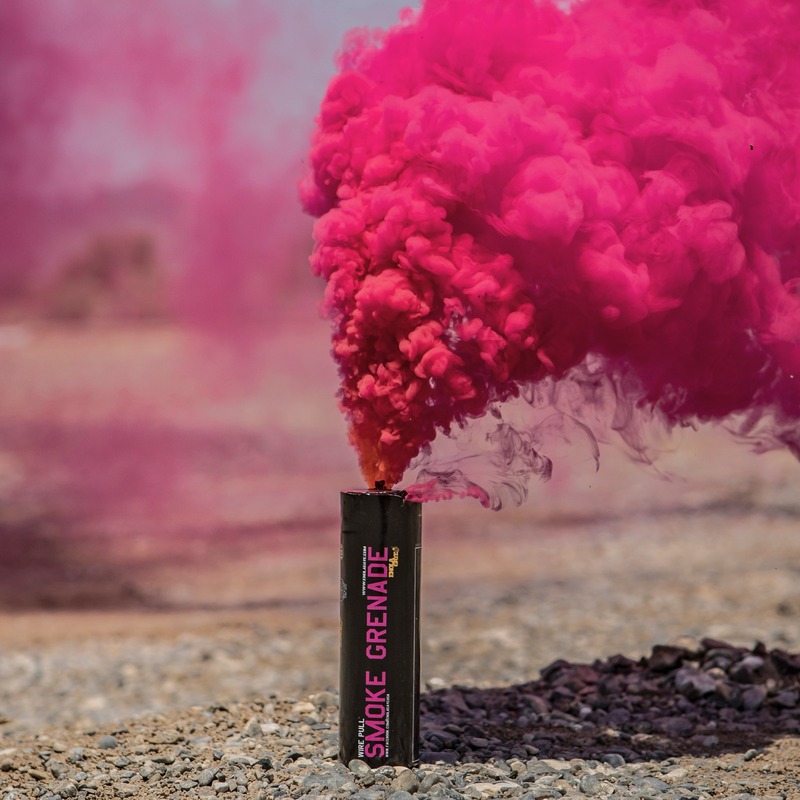 Having a lot of experience with smoke grenade photoshoots it wouldn’t be unusual for us to use red smoke as it has quite a ‘pinky’ hue to it, ‘so surely it’s just red smoke? Red smoke looks pink’ you may be thinking but when you put a pink and red WP40 together, the red smoke looks far more orange and shows the pink to be a true fuchsia hue – it’s bright and the output is what we would expect for a WP40. Needless to say, I am absolutely in love with the colour and think it’ll be a big hit among photographers, street artists and airsofters alike. Pink smoke was released in Canada late last year, in the US earlier this year, and it looks like the UK will be set to get them later this year/early 2019. Hardwick, K. (2018). SMOKE THE RAINBOW. 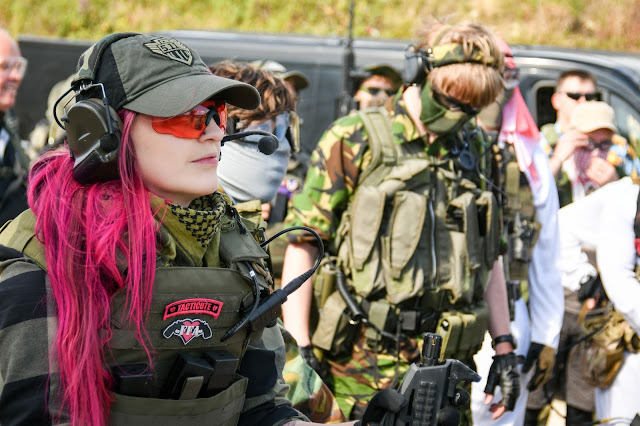 Airsoft Action. 80 (November), 24-25.